March 24, 2018, marks the 19th anniversary of NATO’s illegal and illegitimate bombing of Yugoslavia, Serbia and its Kosovo province during 78 days. It has – one is tempted to say, of course – been conveniently forgotten by the West itself. While Clinton may be best remembered for his relations with Monica Lewinsky and his wife, Hillary Clinton, some of us also remember him (and Albright) for bombing Afghanistan, Sudan, Bosnia-Hercegovina and contributions to the proportionately largest ethnic cleansing in Yugoslavia – of Croatian Serbs out of Croatia’s Krajina, Eastern and Western Slavonia where they had lived for about 400 years, in Operations Storm and Flash in 1995. Clinton was also the President who started the expansion of NATO against assurances about never doing so given by leading NATO politicians to Mikhail Gorbachev. But the former Yugoslav republics are now NATO members (Slovenia, Croatia and Montenegro). Clinton also upheld the sanctions on Iraq’s innocent citizens even after 500,000 had died. By an objective analysis of the contemporary history of interventionism and militarism, Russia’s response to the de facto coup d’etat in Kiev by [allegedly — DV editor] annexing Crimea would, one should expect, be compared with such fundamentally important and international law-violating policies and, likely, found to be minor in comparison. But that, naturally, is impossible for those who have reasons to be in denial of their own wrongdoings and large parts, therefore, of the post-Cold War history. With a history like that – and more since then – it is no wonder that the West/NATO must blame everything evil on virtually everybody else: Russia, Syria, Iran, North Korea and China in particular. In psycho-political terms, it’s called projection while others might call it amnesia or attention-diversion that fit new crimes. A good doctor causes minimal pain and blood loss. Western conflict doctors, accompanied by their arms traders, spilt as much blood as possible, on top of what the various domestic governments, private warlords and paramilitaries of Yugoslavia were able and willing to do to each other. To make this Western – remember, Russia was in turmoil and could play no role – quackery succeed, at least in their own eyes, the self-appointed peacemakers of our world had to produce a number of novel tricks – all of which makes the long-term effects of this Yugoslavia’s dissolution more significant than the fall of The Wall. 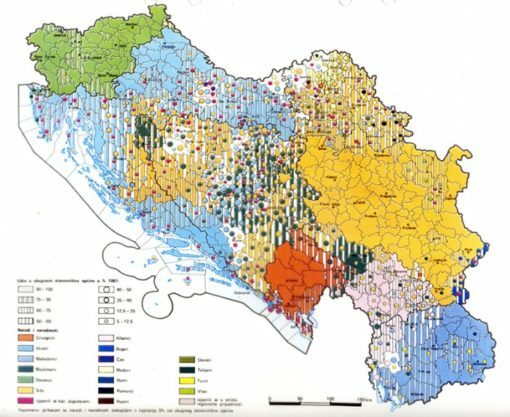 • Recognising these two republics out of Yugoslavia while not having the slightest idea about what to do with the remainder of Yugoslavia and, thereby, making the war in Bosnia-Hercegovina impossible to avoid. • While one can certainly argue that the UN was undermined by many other wars before those in Yugoslavia, Vietnam not the least, it can be argued that it was here the UN became a victim of systematic marginalisation and accused of being useless and even complicit in its policies and on-the-ground missions – to the extent that the UN has not been thought of as a central peace-keeper, -maker and -builder in any of the large conflict zones since 1999. • And it is, finally, the conflict in which commercial marketing companies – such as Ruder Finn – were brought in to secure an advantageous but deceptive global image of Croatia, Bosnian Muslims and Kosovo-Albanians. Powerful narratives that serve certain interests but not truth in any sense didn’t start with Syria. Neither did monopoly media’s loyalty to their governments and addiction to simplifying two-party narratives that were particularly misleading here, in one of the world’s most complex conflict formations. 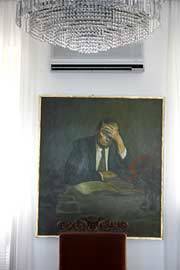 This author served as goodwill mediator/adviser to three governments in Belgrade and to the non-violent leadership team of Dr Ibrahim Rugova in Kosovo. They wanted an independent state but only through non-violent means – and were therefore soon marginalised by the West which, with the particular contribution of the German intelligence service BND and the American CIA, instead invested in the darkest and most criminal circles in Kosovo and set up the Kosovo Liberation Army (KLA/UCK) which later served as a kind of army on the ground for NATO’s bombing raids. We developed a plan for a negotiated solution to the conflict based on a total ceasefire, UN presence and monitoring and a three-year negotiation process. It was shaped like an international law document. As far as we know, it is the only plan that was widely discussed and presented in details in both Serbian and Albanian media. It turned out soon to be all in vain. The US and NATO allies had other plans – and they were not about peace. The Rambouillet meetings were totally fake, meant only to secure that Belgrade would say No and the Albanian Yes. Then Assistant Secretary of State, James Rubin, formulated it so well – people thought: Today the Serbs have chosen war and the Albanians peace. He said it to his wife, Christiane Amanpour on CNN – State war policies and monopoly media already then in symbiosis. Who would not have smelled a rat here? NATO could then have started a war from inside Serbia itself, having already a first contingent on the ground, or they could move to arrest President Milosevic at some point. Surprise, surprise: The Serbs said no and the Albanians were enthusiastic. TFF’s team of Yugoslavia experts, psychologists, media people, peacemakers etc. was on the ground everywhere, conducted interviews on all sides (some 3000) and roamed around with flak jackets also where no embassies were found. No Western government ever took any interest, except former US Secretary of State Cyrus Vance and his team whom we had a long conversation with in a late evening at his hotel suite. A delightful intellectual with a heart, a moral man – who was quickly sidelined by the Clinton administration and one of the students Vance had taught diplomacy – Warren Christopher. Over the years, three TFF Associates – Johan Galtung, Hakan Wiberg and Jan Oberg who in total had about 130 man-years of experience with Yugoslavia – wrote the equivalent of about 2000 A4 pages of main comprehensive conflict analyses and peace proposals and some debate articles and press releases. 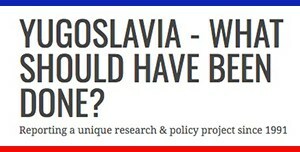 They’re all gathered – as they were written at the time – in the blog 1 report “Yugoslavia – What Should Have Been Done” which is not only the largest peace research publication about Yugoslavia but also a frontal criticism – with alternatives point by point – of how the West practised what must be termed peace prevention. This article was posted on Friday, March 23rd, 2018 at 6:48pm and is filed under (Ex-)Yugoslavia, Anti-war, Media, Militarism, NATO, Propaganda, Russia, Serbia, War Crimes.